The following are instructions for participating in our public Alpha testing program. The Alpha testing program allows Event Espresso users participate in testing new features and bug fixes for the first time in preparation for releasing a new version to the Pre-release Channel (PRC). This is separate from the PRC which is a public Beta testing program. Create a free account on GitHub (if you don’t have one already). 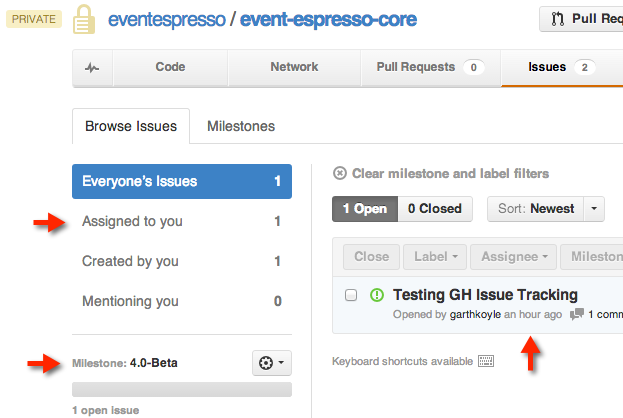 Request access to the Event Espresso GitHub private repository. 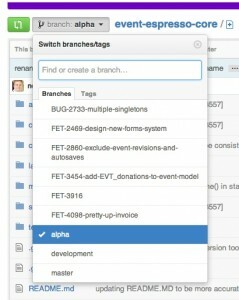 Select the “Alpha” milestone (or other applicable milestone) from the Branch drop-down menu. Click the ZIP button to download the most up-to-date files. Install the latest version on your testing server or locally for testing purposes. Do not use these files on a production/live environment. These files are for testing purposes only. Find one issue you’re comfortable testing by browsing the entire list of issues in the Alpha milestone or viewing the issues that have been assigned to you. Note: But with the first release of Event Espresso 4, you are testing a Alpha branch to resolve any final bugs. In future releases of Event Espresso 4, you’ll be testing an Alpha branch. After you find an issue you’d like to test (or , make a comment that you’re going to test that issue. Begin testing (in the mean time we’ll try to assign the ticket to you so no other testers duplicate efforts). Provide feedback on the issue in the ticket. When you report that the issue is fixed, an Event Espresso admin will close the issue. Note: you can close tickets which you create. Also see our note below about the difference between bugs and feature requests. Go to the “Issues” tab, click the “New Issue” button. Fill out the New Issue form by adding: 1) a title, 2) selecting the appropriate milestone, 3) adding a description (with as much detail as possible), 4) adding labels, and 5) submitting the form. If you are reporting a bug, please give us as much detail about your testing environment (computer, browser, server, etc.) and instructions about how to reproduce the bug. What is the difference between bugs, Enhancements and Feature Requests? Bugs exist when a feature within the program does not perform as designed. Enhancements are suggestions to improve a feature as it is currently designed. Feature requests are petitions to add new features to the program that do not exist. 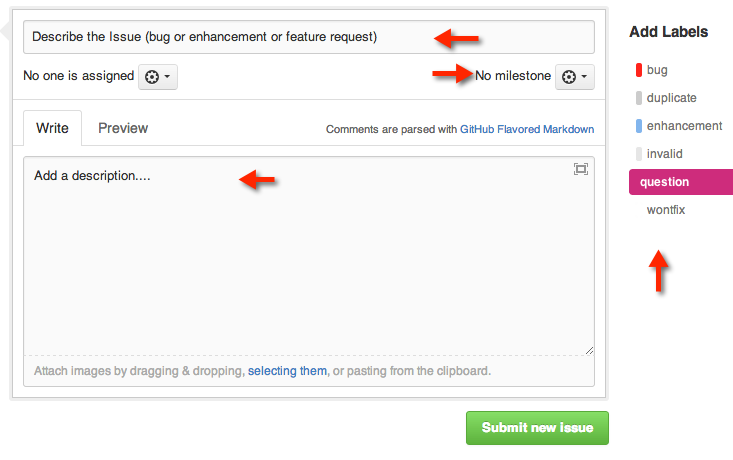 Enhancements and feature requests should be given their own GitHub issue, and not combined into a single ticket. How do I use GitHub? Another good question. The best thing we can do is refer you to the GitHub Help documentation.